Today, It was a beautiful sun-covered dressage day in Kronenberg. The Judges and Spectators were able to enjoy some wonderful tests in the main stadium of Equestrian Centre De Peelbergen. Team Austria took the lead in both the individual and the team ranking. 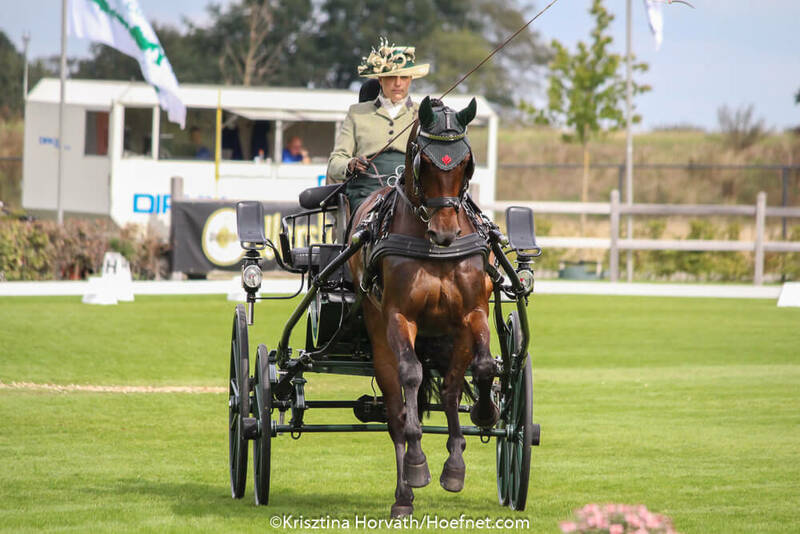 Austria’s Rudolph Pirhofer topped the competitors with a stellar 46.73, followed closely by Renaud Vinck from France at 47.58 and only 0.05 better than home driver Saskia Siebers at 47.63. Pirhofer boasts 7 Austrian Championships and was third in the Worlds Championship in 1998. Vinck, in a scarlet military attire, stood out among his peers with his near perfect execution of Dressage movements driving the horse Lanzaro that was actually his substitute horse. France had one of the two horses that was eliminated in the Inspection. Siebers started driving in 2009 and has accumulated an impressive record of wins in the Netherlands, Germany & France in the intervening years. Tomorrow is Marathon Day with eight technical obstacles, designed by German Level 4 Course Designer Josef Middendorf. The single drivers will drive eight obstacles, the para equestrian competitors have six hazards to conquer. The first competitor will start at 08.30 in the A-section.